Lithium-Ion batteries have been used in various devices for a long time. The recent technological advances in electric vehicles (EV) have shifted the presence of the batteries and lithium as a commodity to much higher level. Since an emergence of Teslas and other e-cars, e-bikes, e-skateboards, e-surfs, e-whatever; demand for lithium has been constantly rising and it is expected to increase 650% by 2027. These early times in relatively new industry must offer an opportunity to invest in lithium and lithium-related business. Investing in lithium is not that clear and easy due to slight fogginess this sector needs to tackle yet. Nevertheless, an outlook is certainly bright and we believe a healthy trend in lithium-related industries is starting to shape up and thus, Trade Via Trend is going to look for every possible investing opportunity. Lithium can be extracted from two different sources using two different technologies: Usual mining procedure – breaking a hard rock or by evaporation of a lithium brine. Both methods are used for lithium production although they significantly vary in economic and ecological aspects. When magma moves around the continental plates, the mineral-rich rocks – Pegmatites are being formed. As a temperature goes down, the minerals including lithium get concentrated in form of crystals. Lithium extracted from hard rock comes from the crystals that are found in Pegmatites. The largest lithium mine in the world is Greenbushes in Australia. Lithium dissipates via volcanic ash, magma or rocks. Rainfall drags the lithium into a lake from where it evaporates and gathers in a higher concentration. Either in hard rock or brine, the grade of lithium is the most important factor. If the concentration is high in a hard rock site, then even a missing infrastructure near the site is not a problem, because it is still economically viable. Demand for lithium is expected to grow constantly, this is clear. The question is how supply can cope with quickly increasing demand. There are mixed opinions about this. The market research analysts mostly claim the supply is going to be a problem due to the complexity and duration of production as explained above. On the other hand, the other researchers believe supply is going to overtake demand due to an increased number of lithium miners and improvement of technology. 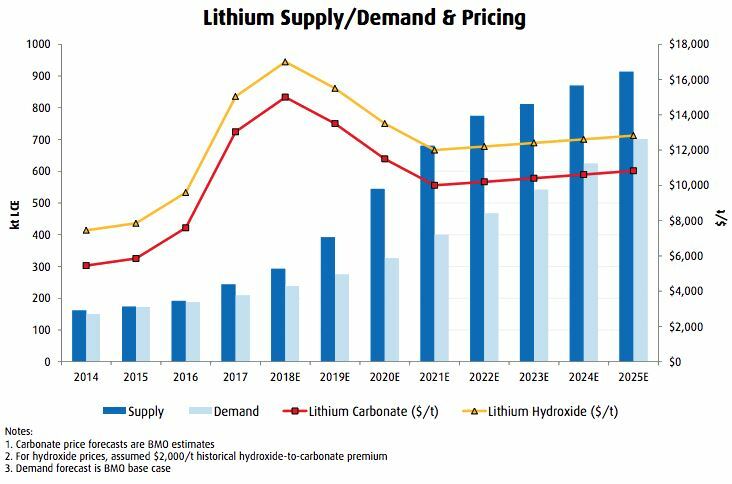 Based on the very recent research by BMO, the price of lithium is expected to peak this year and then consolidate for 2-3 years. The price of a commodity has an impact on the profits of mining companies and thus, it is important to watch how this is going to revolve in the upcoming year. It will be a crucial element when elaborating lithium miners for possible stock trading. 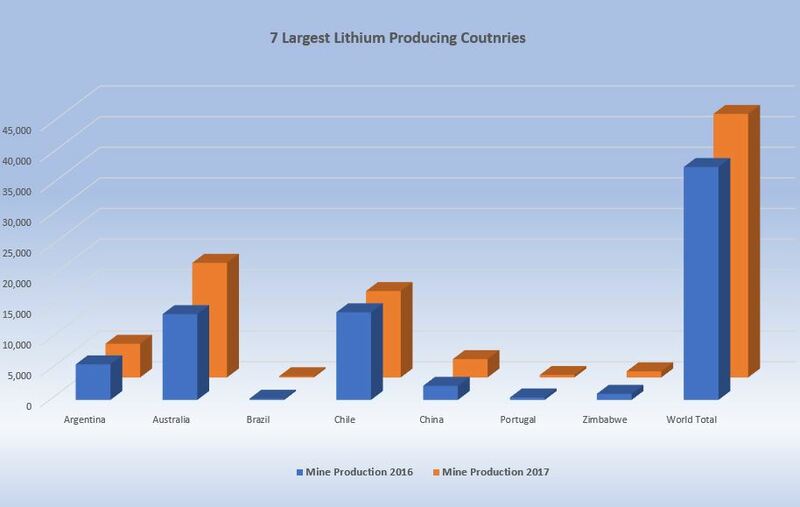 Most of the lithium is produced in only 7 countries around the world. The first place in production contest was taken by Australia in 2017. Down Under produced 18,700 MT of lithium last year. Australia has Greenbushes lithium mine which is the oldest and the longest operating lithium mine in Australia. It is owned by Tianqi Lithium and Albemarle miners and represents currently the most valuable lithium mine around the globe. The second place belongs to a country on the other side of the planet – Chile. The country produced 14,100 MT of lithium in 2017. In contrast with Australia’s spodumene operations, Chile operates the lithium brines. Third Argentina and fourth China produced also a significant amount of lithium last year – 5,500 MT and 3,000 MT respectively. Fact is that Chile was a top performer in 2016. The production has actually decreased from 14,300 to 14,100 MT. Unlike in Argentina, where a reason for a decrease from one year to another was an unfavorable climate, in Chile, the reason was rather political. Chilean authorities failed to cope with increased demand in sense of granting the permits in the smooth matter. In other words, the responsible persons could not agree who should mine and how much. However, this should be sorted and Chile will likely regain its first position within 2-3 years. In terms of lithium reserves, the South American country holds almost half of all reserves of the world. 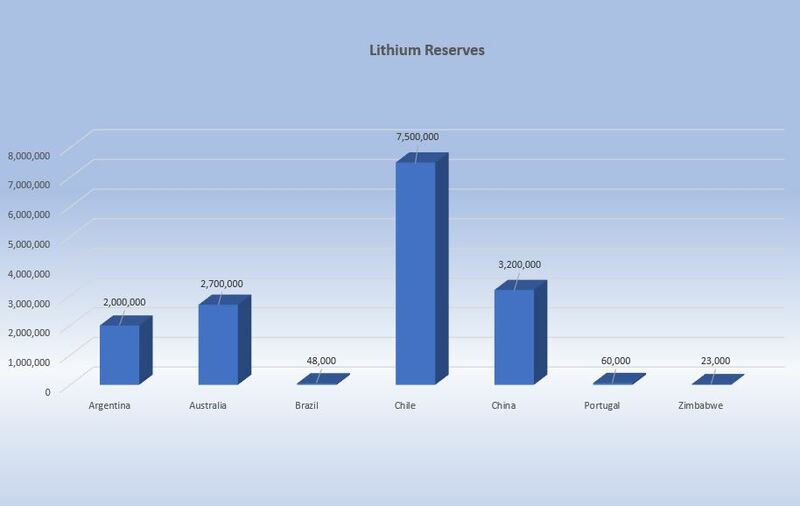 Chilean reserves represent 7,500,000 MT of lithium. Second is China that has about half of Chile’s amount and third is Australia. Lithium as a commodity is not traded on any exchange. Compared to other commodities it is a very little player to be represented by commodity futures at the moment. The price is determined by a simple agreement between two parties – seller and buyer. Thus, demand and supply play a crucial role when mining companies and their lithium purchasers build their contracts. Hence, it is impossible to trade it like gold or copper and investors need to look another way how to profit from the current lithium spree. Lithium Hydroxide is more expensive than Lithium Carbonate due to its properties that are highly desired in batteries. Unlike in past years when price accelerated, this year is sloping it down. This is due to a fact that mining companies have secured the agreements with top producing countries especially in Chile to significantly expand production. It is expected that there will be the surplus of lithium in upcoming years. A vast majority of lithium output is performed by only 4 mining companies. One may state that the industry currently a big oligopoly, which in fact is a truth, however the market caps are not yet drastically big. Certainly it’s not going to be easy, but certainly, it shouldn’t be too hard to enter this market for new wannabes with appropriate experience. Permitting and political arrangements are going to play a key role for smaller miners. As with every other commodity, the miners’ stock prices are quite dependent on the price of lithium. Commodity price decreased, the stocks also took a downward direction. Below chart depicts the stocks are positively correlated, although some are more volatile than the others. The most important fact is that they are starting to trend! As the demand for batteries due to need in the electric vehicles surged, the stock prices flew considerably. As we learned about possible supply surplus, the prices are going down. When gold price moves, the gold miners’ stocks move much, much more! The same is going to be happening with lithium. This will give the traders a fabulous opportunity to take advantage of the price swings. Then, there are also junior miners trying to enter the market. Investing in a right one in the early stage may bring you a fortune in a few years. However, this is a risky game and the investor needs to understand a gameplay very well to be a winner. Below are the top 5 lithium small caps that poses the best attributes to enter a lithium mining market successfully. They will, of course, need some time, so we need to keep a close eye on these – fabulous opportunities may arise. Finally, there is also a possibility to trade an exchange-traded fund (ETF). The only good one so far is Global X Lithium & Battery Tech ETF (LIT), which has been behaving considerably trendy. Swing traders might enjoy this ETF, even though it’s not really upward sloping, the support and resistant levels hold here pretty well. Lithium has become a popular commodity due to its high volume need mainly for electric vehicles and power storage batteries. Powerful batteries for EVs or other devices are shaping the industry now and thus, the investors may profit very well if they participate in this young and growing business. Demand for lithium is going to rise exponentially within the next 10 years when demand and supply will be dancing in a rhythm of profit for clever investors. There is much more than miners in this business. The things relate and thus, profit-making may emerge where you would just not expect it. Trade Via Trend is going to watch the lithium industry and publish unique trading ideas and market opinions when the opportunity arises.